Having done Dublin Bus, it occurred to me to see if the Bus Eireann network was available. It is. This is actually a bit more interesting than the Dublin Bus one for various reasons, specifically the gaps. I’m fascinated by the big hole in the middle and I will probably look at doing some additional work in terms of other spatial data. I’ve just been asked where I get the data and it’s remiss of me not to credit the data source. 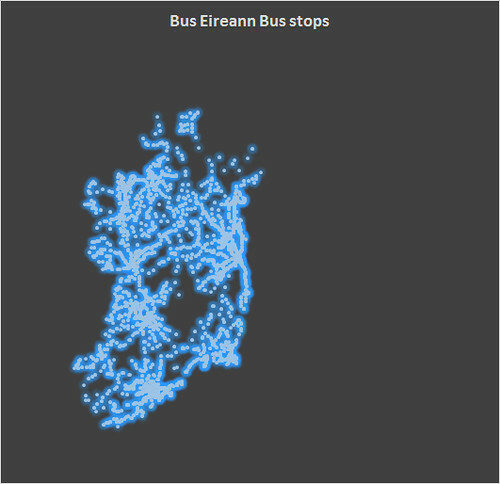 The data for both Bus Eireann and Dublin Bus, plus a number of other operators is available on Transport for Ireland’s website. The link is here. I haven’t cleaned up this graph all that much and I have additional plans for this and the other transport data that I have been looking at.